The Wolf River Conservancy was founded in 1985 when a group of volunteers came together to successfully oppose a new gravel mine along the Wolf River near Summer Avenue in Memphis. Afterwards, these volunteers chartered the Wolf River Conservancy as a 501(c)3 non-profit organization dedicated to the protection and enhancement Wolf River lands for sustainable recreation and education. The founding members had a vision of the Wolf River as a future Greenway and wildlife corridor through the city, protected from the kind of degradation suffered by waterways such as Nonconnah Creek in south Memphis. 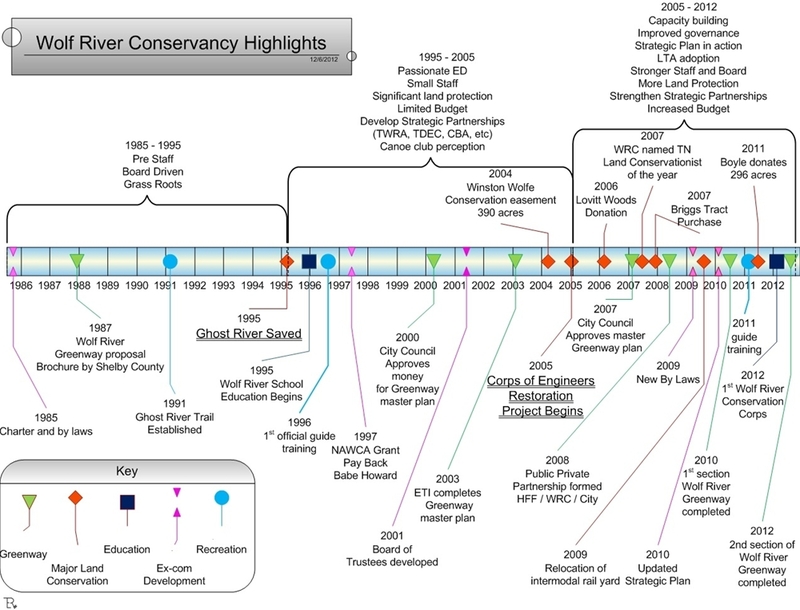 Since 1985, the Wolf River Conservancy has expanded its mission, its staff, its resources, and its membership. We have helped to protect over 16,000 acres in the Wolf River corridor, including the beautiful Ghost River State Natural Area, launched the transformational Wolf River Greenway project, and connected thousands of people of all ages to the Wolf River through education and recreation programs. Our vision includes the protection and enhancement of the entire Wolf River floodplain, from its origins at Baker’s Pond in North Mississippi to its confluence with the Mississippi River in Memphis, thereby providing a recreation and wildlife corridor of over 90 miles while protecting critical aquifer recharge areas for public drinking water.